Please note that this current website does not have a shopping cart. 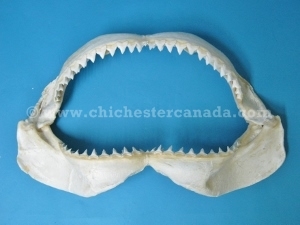 To buy our Bull Shark Jaws online, please go to our e-commerce website at NaturalExotics.ca. These are real bull shark jaws from the waters of Taiwan. They are specimen quality and are thoroughly cleaned. They are available in three sizes, while larger ones are listed individually on our gallery. Genus and species: Carcharhinus leucas. Wild. Bull sharks are not endangered and are not subject to CITES controls.